Don't worry about finding the right case for the AlphaTrack... Frontier Designs (pun intended) designed the perfect case for you. 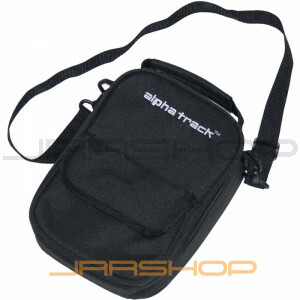 The AlphaTrack Gig Bag is appropriately sized, has compartments for your USB cable and other kinds of cables, a comfortable shoulder strap, plus a pretty nifty AlphaTrack logo. Let people know who you rep! rep Frontier Designs of course.